These are perfect for your dessert bar or your next tailgate party!! 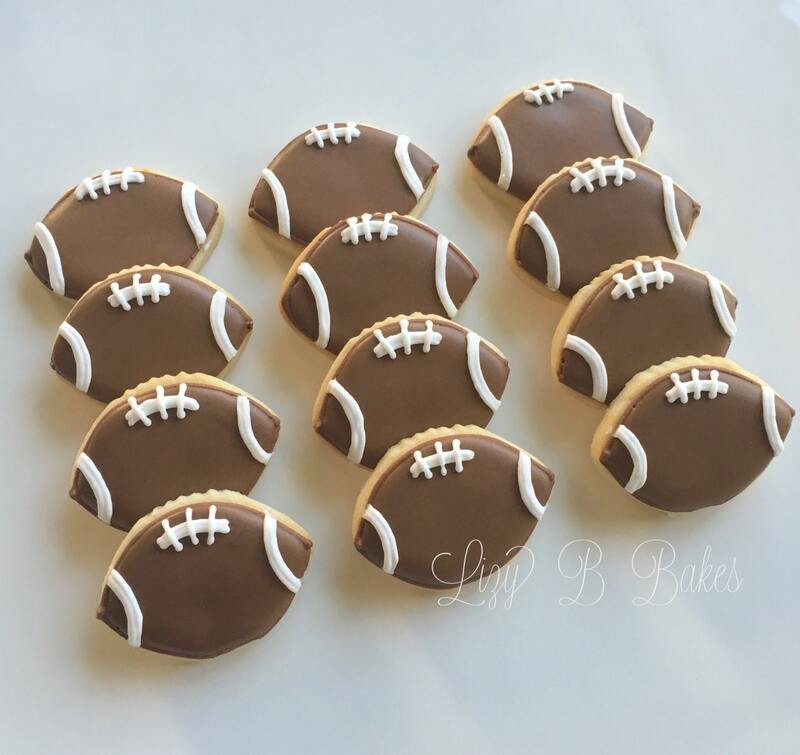 This listing is for 36 mini football cookies! Dimensions are approx. 1.5"'. Colors can be changed to match your decor. Please choose a color to be used with white! These are Delicious Vanilla Sugar Cookies, beautifully iced with shiny Vanilla Flavored Royal Icing and are always made to order! Cookies will be heat sealed in a crystal clear cello bag, 4-6 cookies per bag. These cookies do not contain preservatives. Please keep them in their bags until ready to be served. They will stay fresh in their bags for 2-3 weeks. WHAT IF I NEED EXTRA COOKIES? Extra cookies are $12 per dozen. Contact us to add additional cookies! Cookies should be ordered at least three weeks before you need them. Gorgeous cookies take time! We need at least 5-7 days production time BEFORE they are ready to be packaged! Orders are shipped by USPS Priority Mail and are sent out 5-7 days before the date needed. Your order is important to us and is packed with the utmost care. However, once the package is out of our hands, we cannot guarantee there will not be breakage. Please order extra cookies to allow for breakage. All cookies are made to order and perishable. Therefore, ALL SALES ARE FINAL. In addition, no refunds will be given due to breakage. These cookies contain eggs, wheat, and dairy. They are made in a facility that contains nuts. Don't see exactly what you need? I love custom orders! Contact me and I'll create something special just for you! Thanks for visiting Lizy B's Bakeshop! 36 Mini Catcher's Mitt Cookies! 36 Mini Baby Shower Cookies! 24 Mini Baby Shower Cookies! The cookies were perfect and so tasty! Shipping was super quick and everything was packed so well - not one broken cookie! Will definitely be ordering again! This shop accepts Paypal and Direct Credit Card Payments. All listings are first come, first served and are limited. CAN I SEND THIS AS A GIFT? Of course! Just let us know this is a gift and we'll remove your invoice from the box. We'd also be happy to include a gift card. Be sure to include your message in a memo when ordering. 24 Mini Banded Baby Onesie Cookies! 12 Cross Cookies with sugar pearl detail! 24 Mini Rosebud Baby Shower Cookies! 12 Large Personalized Mason Jar Cookies!